Podcasts have become a major source of entertainment and education over the past few years. There are thousands of shows in all types of categories from health to money to comedy. Back in 2013, I even had my own podcast, which was short-lived at a mere fourteen episodes. One of my regular habits is to listen to my favorite podcasts while I’m walking around New York City. It’s helped me become more creative and thoughtful in my business, career and personal life. Here are my top recommendations for the best podcasts that focus on the workplace and career success. Most of these are in interview formats because I feel that they are more engaging and interesting to listen to that way. HBR IdeaCast (iTunes). In this weekly show hosted by HBR Editor Sarah Green, you will learn from some of the worlds most prominent management thinkers from Clayton Christensen to Sydney Finkelstein. Green covers a wide range of topics from how to give constructive feedback to making better decisions and the connection between speed and charisma. The episodes come from articles that are published in the Harvard Business Review, blog posts on HBR.org and from Harvard Business Publishing authors. The Tim Ferriss Show (iTunes). I’ve interviewed Tim several times in the past so I can attest to his brilliance and thoughtfulness when it comes to career management and life advice. His podcast breaks down the habits and advice of some of the most prominent people from Jamie Foxx to Peter Thiel. Each episode is about an hour in length and dives deep into the lives of these individuals so that listeners can walk away with new techniques that will enhance their career and lives. Game Plan by Bloomberg News (iTunes). This podcast examines some critical issues impacting the workplace, from sexual harassment, to the rise in robotics, to job searching and even questions the traditional career path. Hosts Rebecca Greenfield and Sam Grobart discuss the most importance factors and influences on today’s workers every week, based on their Bloomberg columns. Greenfield has previously covered my research and is one of the newest and best voices covering the workplace. Corner Office from Marketplace (iTunes). If you want to learn, and be inspired, this podcast shares the stories of some of the biggest luminaries in the world. In less than a half hour host Kai Ryssdal interviews successful CEOs, including Jack Dorsey, Elon Musk and Brian Chesky. While there are a lot of podcasts with interview formats, few have these guests who raraly give interviews. The show has new episodes every other week and is comparable to the famous New York Times “Corner Office” column written by Adam Bryant, but in audio format. StartUp Podcast (iTunes). If you’re an entrepreneur, or aspire to be one, this podcast will help you make better decisions and avoid common roadblocks. Alex Blumberg is an entrepreneur himself, as well as a former producer at This American Life, and he takes you through the creation of his company, Gimlet Media. Some of the topics that are discussed include how to grow your company, having a more diverse employee base and being married to your business. The GaryVee Audio Experience (iTunes). Gary Vaynerchuk has inspired millions of people around the world to “crush it” in business and in life. He chronicles his “hustle” throughout his keynote presentations, and daily #AskGaryVee show, both of which you can listen to for free in this podcast. I’ve interviewed Gary for nearly ten years now and he not only walks the talk, but delivers the advice you don’t want to (but need to) here. His charisma and intensity will drive you to work harder and achieve more in your career. TEDTalks Business (iTunes). From the TED Annual Conference to TEDx events around the world, this collection of business thought leaders share fascinating new ideas and information around the most critical topics impacting our work lives. Whether you’re listening to some of my favorite thought leaders, including Simon Sinek or Dan Pink, or names you haven’t heard previously, this collection will open your mind and your heart. The AoC Podcast (iTunes). With nearly six hundred episodes, this podcast helps self-motivated people become better communicators and build stronger relationships. The host, Jordan Harbinger, has become a friend of mine and I appeared on the show about a year ago. He’s interviewed everyone from Tony Hawk to former astronaut Mike Massimino and spends about an hour digging into their stories and advice. Harbinger’s focus on psychology and emotional intelligence have made the podcast a major success with millions of downloads. Entrepreneurial Thought Leaders By Stanford eCorner (iTunes). This is one of the first podcasts I ever listened to as I built my second business because they sit down with some of the most prominent entrepreneurs in the world, many of whom graduated Stanford University. There are about five interviews each money with prominent people like Elon Musk, Scott Cook, and Reid Hoffman. What makes this podcast series so successful is that you get a variety of perspectives from entrepreneurs, venture capitalists and other members of the startup community. The James Altucher Show (iTunes). In this podcast, host James Altucher, speaks with all different types of people from Dan Ariely to Jewel to Evan Williams about their career struggles and triumphs. Altucher, who is a friend and mentor, has his own unique story of many failures and successes as he has launched various books, products and companies over his lifetime. What makes this show unique is that it’s highly conversational and he asks really intelligent questions that make his audience smarter and more open minded. Slate’s Working by Slate Magazine (iTunes). The show host Jacob Brogan interviews all types of workers, from an immigration lawyer to freelance makeup artist, to explore their daily lives. When you listen to these interviews, you have a deeper connection with average, non-billionaire or celebrity, Americans and what their work day is like. This show is especially useful if you’re looking to start a new career and have no idea what you’re in for. The School of Greatness with Lewis Howes (iTunes). I’ve known the show’s host, Lewis Howes, from the time when he was crashing on his sisters couch trying to make ends meet and now as one of the prominent faces in the Internet marketing world. I’ve previously appeared on his show, and have seen watched him interview people such as Scooter Braun. What makes this podcast special is that Howe’s digs deep into who the interviewees are as human beings outside of their success stories. 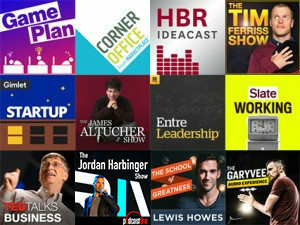 The EntreLeadership Podcast (iTunes). Hosted by Ken Coleman, who is part of the Dave Ramsey enterprise, this podcast dives deep into the stories, advice and ideas from many notable figures. Guests have included Marcus Buckingham (who wrote my book foreword), Jim Collins, Daymond John and Jack Welch. While Coleman focuses mostly on his guest’s new books, shows or programs, you get a lot of great insights into what they’ve learned in their career and how to apply it to yours. Thanks for the shout Dan! Honored! Nice recommendations! The list is a full blast! As we start the year, this is really a great article to read about and some of the best podcasts to listen to. Every year, I try to really align my goals and my opportunities towards the career success I am hoping for. Recently, I also had this article ( http://www.bizcatalyst360.com/new-year-new-career-4-skills-to-help-you-on-your-career-change/ ) on my screen as I was looking for some skills I can develop to farther my career. I hope this will also help someone out here. Thanks for the great list, Dan! I’m always looking for new podcasts.